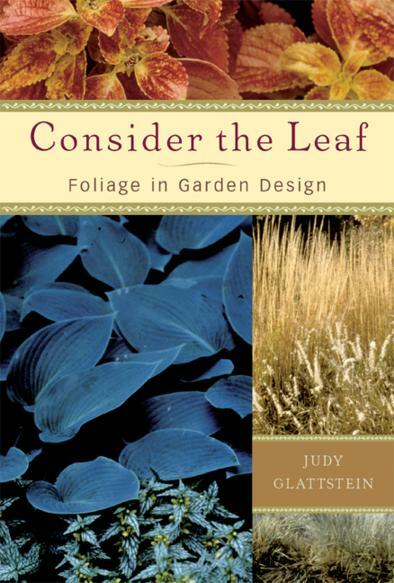 It has been ten months since Consider the Leaf: Foliage in Garden Design was published by Timber Press. The topic seems straight forward and obvious to me, but apparently is somewhat puzzling to others. Timber Press had me respond to a simple questionaire on their web site, which will explain the book's rationale in a concise manner. Q. Why would a gardener want to choose a plant for its foliage, rather than its flowers? A. Foliage makes the gardener's task easier: when plants are in bloom the foliage provides an attractive background and (even more important in my opinion) when flowers are absent the plants continue to provide visual interest. Q. What traits make a "good" foliage plant? A. A good foliage plant has leaves that are appealing for their shape, texture, and/ or color, whether green or otherwise. Keep in mind that it is combination and contrast of foliage that creates the display, not just one isolated plant growing in lonely splendor. Q. Are good foliage plants hard to find? Where can gardeners find foliage plants? A. Gardeners can find foliage plants of excellent quality at any nursery, garden center, or other places where plants are sold. It is a matter of refining your perception to look at the foliage with a discerning eye rather than just fixing attention on showy, come-and-go flowers. Just think of the popularity of hostas, ornamental grasses, herbs, and coleus, all of which are grown for attractive foliage. Q. Are foliage plants any easier to care for than flowering plants? A. I think that on the whole, foliage plants are easier to care for than flowering plants - but keep in mind that foliage and flowers are two different aspects that are found on the same plant! However, in their flowering "persona," plants need frequent dead-heading as flowers wither and seed starts to form. Q. Where can foliage plants be grown? A. Any place you grow plants means foliage is one very important design option to consider. Sun or shade, temperate or tropical, moist to dry, outdoors or even on a windowsill - plants have leaves and making the right foliage choices creates beautiful gardens whether in or out of bloom. A large envelope stuffed with reviews arrived from Rebecca Ragain, my publicist at Timber Press. Authors love getting envelopes like this, especially when the reviews are as favorable as these. From Perennial Notes: "This is the guidance I was looking for. . . . the fix is here, in Glattstein's inspirational prose and descriptions of effective plant combinations." In Taxon 52: "A delightfully different, innovative approach to the aesthetics of gard. design - highly reccommended." Journal Inquirer "This book is a treasure trove of solid information about foliage plants along with wonderful suggestions for plant combinations where foliage takes center stage." Isthmus: Abode: " . . . it's full of more practical ideas than a year's subscription to most gardening magazines." The Irish Garden magazine called it "An engrossing read." On December 18th Paul and I went to the New York Botanical Garden for our annual visit to see the Holiday Garden Railway exhibit. Held in the Edith Haupt conservatory, it is a perennial delight. Buildings, bridges, and more, all based on historic New York City structures, are made of plant parts: leaves, seeds, pods, and cones. They are charming, magical, and fairy-tale fantastical. There is a replica of the conservatory itself, of the New York public library (complete with lion statues by the steps), Rockerfeller Center with skating rink, and many, many more. The buildings are stored from year to year, and new ones always added. Garden railway size trains (bigger than HO) chuff around on their tracks, appearing and disappearing from view behind the plants. There are even trains crossing overhead, on trestles and bridges built from wisteria vines and other branches. Held every year from around Thanksgiving to shortly after New Year's, the train show delights adults and children alike. Paul and I prefer to go on a weekday, and before Christmas, whenever possible, simply because the exhibit is less crowded. But perhaps part of the fun is seeing children and their unaffected delight. Here it is, Monday, December 29, and the year is winding down to a close with a sunny yet chilly morning. Frost crystals gillter at sunrise, then melt as mid-morning warms towards the freezing point. Bare branches of deciduous trees lace skyward, while the green boughs of old field cedar, Juniperus virginiana make a green contrast. Conifers, evergreens, offer winter interest, with needle-fine foliage in shades of green, glaucous blue, and golden yellow. Dragon's eye pine, Pinus densiflora 'Oculus-draconis', offers longer slender needles that a green, yellow, then again banded green. While gawky as an adolescent, mature trees have lovely presence. Broad-leaved evergreens are less common here in New Jersey, confined to our native American holly, Ilex opaca, and a diversity of shrubs. Breeding and selection by Dr. Joseph Orton of Rutgers University has given us holly cultivars noted for heavy berry set, yellow rather than red berries, and/ or shapely form. Remember that hollies come separately sexed in male and female plants; while only the females will bear fruit they need a male around to pollinate them.